VISAKHAPATNAM: As Titli crossed the north AP- south Odisha coasts, Palasa and Srikakulam experienced ravaging winds with speed up to 140-150 kmph gusting to 165 kmph since Wednesday night and railway stations such as Palasa and Naupada bore the brunt. The rooftops of the stations blew off and fell on the tracks and many trees were uprooted. The station control rooms were also damaged. Trains were stranded en route and no trains were allowed beyond Srikakulam Road. 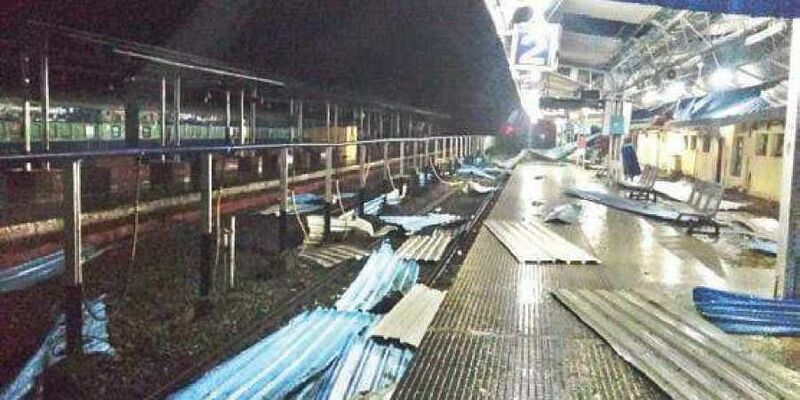 According to Railway sources, restoration works are underway at the damaged stations and will, in all likelihood, be completed by Thursday night. With the delay in running of trains since Wednesday night, passengers at Visakhapatnam railway station had a harrowing time as they had to wait for long hours for restoration of train services. The Dasara vacation added fuel to the fire. As many trains were running on diverted routes, the passengers heading to their villages for Dasara vacation were affected. Many trains are running 15-20 hours behind schedule. According to the Railway officials, as this is the Dasara vacation, they are unable to cancel the trains. To streamline the current situation, they might also cancel some trains, which would affect the passengers planning to go for vacation. Railways had cancelled and delayed many trains running from Khurda Road and Vizianagaram - in both the directions. Due to this, many passengers had to stay put at the stations. Railway officials had stocked sufficient food at Srikakulam and Kotabommali railway stations. They also held talks with district collectors, who took the help of NGOs to provide food and milk to the stranded passengers. Railway teams, including track specialists, bridge engineers and electrical engineers are conducting a detailed study on the impact of cyclone between Brahmapur and Palasa as well as Palasa and Kottabomali.